Who is Kristin Maverick’s mentor? Kristin Maverick is Director of Communications at Carrot Creative, and was previously an account executive at Bite Communications. 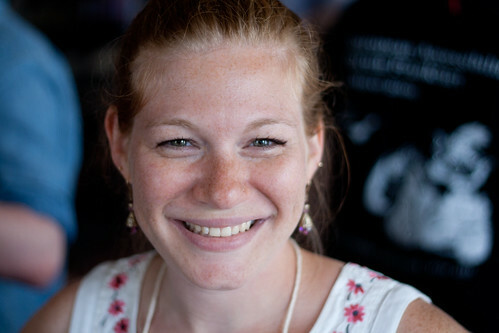 She is the co-organizer of Digital DUMBO, a monthly gathering of Brooklyn digerati. Follow her on Twitter @kmaverick. I met Chantelle at my former job Bite Communications in 2006. She sat at the desk across from me and we instantly hit it off. Literally. Within her first week I think we went out and grabbed a drink. We’re on a peer level, but I look up to Chantelle as a business woman and leader in an industry that I’m also passionate about, PR. She having a few extra years in the biz has helped mentor me through tough decisions as well as basic ones. She is also one of my closest friends which is an extra bonus as she gives me opinions and advice because she cares, not just because she wants to get something from it. She’ll also tell me no which is SO HARD to do for someone you’re simply working with on a professional level. A simple phone call to walk through something or an email to check if my brain is in check is a weekly ritual that goes both ways with the two of us. I value our relationship because I know that even if she doesn’t have time to look at something now, it will happen soon enough and she’ll put the time in to give me feedback. How formal or structured is the mentorship? Does Chantelle know you consider her a mentor? Now she does :) I think the less formal the better. You learn from people when they’re not expected to provide results. Chantelle just does what she does—and she does it good. No extra thinking involved and it comes across natural and in a manner that makes you want to interact with her. You SHOULD say you did it. Having my hand in a bunch of things I don’t like to take credit for much as I’m a team player. But, she taught me that at times—take the credit and enjoy it. There’s a way of being proud and showing off your work without being cocky. She’s helped me figure out what that means and I think it’s an important one to have. She’s smart. She’s incredibly smart. You get that from meeting her right away. She’s one of those people you should put on your short list if you’re in New York to meet. (Plus, I mean she works for Yelp so she knows the BEST places to go here!) She’s also extremely supportive of her peers/friends and co-workers. I’ve never met anyone that has disagreed with that statement. Thank you Kristin for sharing your mentor with us! Thank you BOTH for this wonderful post. I consider myself very lucky to have my Kristin in my life – especially when she does nice little surprises like this!